Make everything visible at a glance on the wall. Widely use in kitchen,shop,workroom,garage,work bench. The variety is perfect for all the needs that you have. Such a nice variety of different sizes and shapes to hang different things. Durable made 88pcs pegboard hook fit 1/8 inch and 1/4 inch thick pegboard boards, Can buy together with our pegboard basket. Can be used for Shop,School,Tool sheds,Factory,Warehouse, and Garage. Made of high quality iron, blue & white zinc plated electroplating process ensures that the product does not rust or corrode. 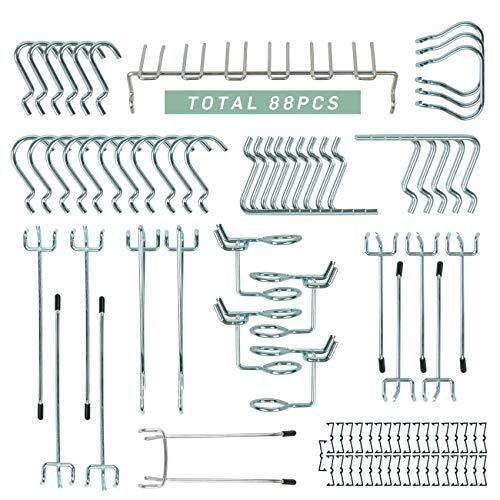 Package Content: 88 pcs different hooks, 12 different type, which offer flexible solutions for a variety of home organization projects. If you have any questions about this product by KINWELL, contact us by completing and submitting the form below. If you are looking for a specif part number, please include it with your message.